…. Which began in 2010. Not prematurely: just that one day in July when either the buck, the does or both weren’t where they belonged, was “the day” for 3 of them (Lotta fence work yet to do in ’11). Does only look visibly pregnant the last 2 months of 5. Despite my best-laid plan, to turn the buck in with them Oct 1, and have all bred to kid in March, 3 were “visible” in November, then started bagging (udders filling) in early December. Jonquil 228 looked bigger by Dec 14 than she did last March 22 when she delivered good twins. And her mother was a triplet. These can be trouble, if two try to deliver at once, or one is breech. If the doe feels two to nurse is plenty and rejects the third, it winds up puny, or bottle-fed. Then December has been a weather nightmare, snow covering the ground a full 4 weeks, and many day temps below freezing. Triplets or not, we prayed they wouldn’t arrive to single digits! Monday morning, 14F at first light, 7:45, dipping warm water into ice-filled horse buckets, I heard a shrill “Maaa!” Columbine 147 had given birth to healthy twins, buck & doe, and had them dry & standing by the time I saw them. The umbilical cords were still red and wet: I clipped them short with pocketknife & checked her, but she left nothing else for me to do. Her placenta would deliver shortly. She gulped her tonic of hot water and blackstrap molasses, then took grain and cookies, so I was pretty sure there wasn’t a triplet on the way. Two sets of healthy twins in one calendar year: what a champ! The other two advanced does looked much as they had the last two weeks. We watch for the sacral ligaments along the spine to relax, but a. it’s less marked than with first-timers, and b. with winter coats, it’s hard to spot. Hyacinth 238 looked broody (staring at nothing, not interested in food) so I shut her in the birthing stall with Columbine & the new twins. Jonquil, however, was chomping hay as fast and loudly as the horses, so I left her out with the others, who are due in a month or so. Checked every hour till 1:30 pm, while Hyacinth continued staring at the ground and Jonquil, in the main stall, continued eating. Neither was pushing, or giving the mild labor bleats that sound more surprised than painful (the human equivalent would be “Hunh?”) So I dashed to the bank, filling station & feed store, a 6-mile round trip, and gulped my own breakfast/lunch. What with heating water for the horses, who were still in their stalls, it was 3 (and 23 outside!) before I checked again. 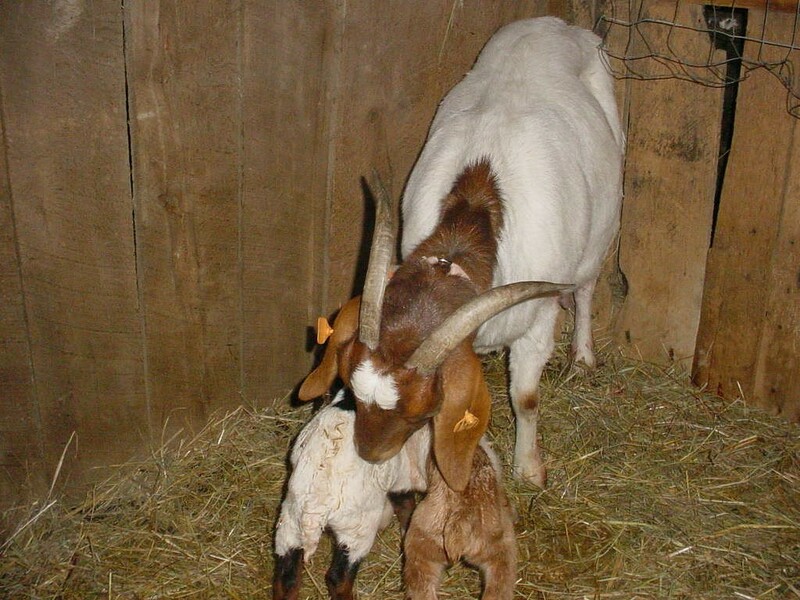 In the birthing stall was Hyacinth with two dry, standing kids. But there was also a shrill bleat from the outer stall. Jonquil had chased the other does outside, and was nosing at a standing, soaking-wet kid. Nearby in the straw were 2 more, equally wet but lifeless. Maybe they had come too fast, or she was simply confused by 3. When I picked up the two limp ones, they opened their eyes and bleated, loudly, always a good sign. With the pile of dry towels Columbine hadn’t needed, I started towelling 2 at once, with minimal success. You’d never credit the amount of liquid the soft coat of a 3-pound kid can hold!!! Jonquil did not appreciate the help, and left a bruise on my right cheekbone with her horn. So I made up tonic & got that into her & Hyacinth – who, BTW, had done well on her own, getting her 2 birthed, dried off and nursing, and placidly chewed thru their placenta during my struggles with her twin. 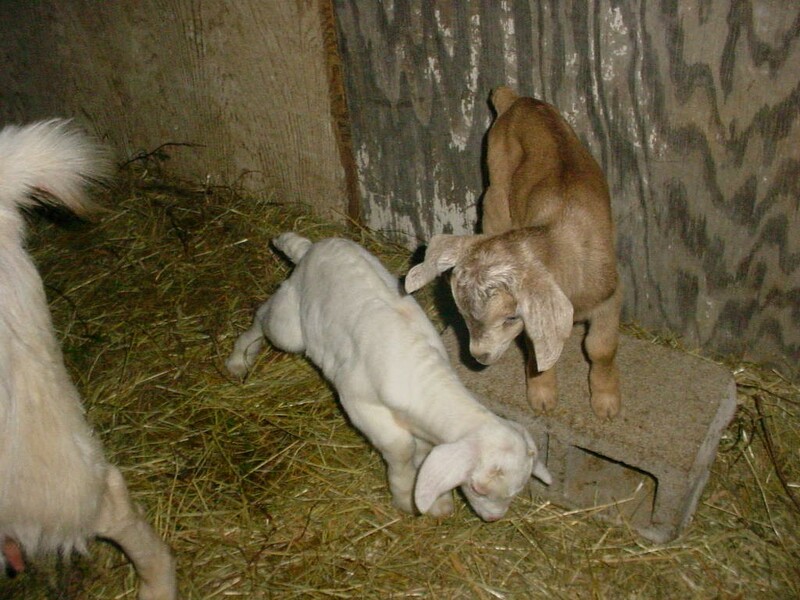 The roan doe kid masters the Cinder Block, looking down on her white twin brother. 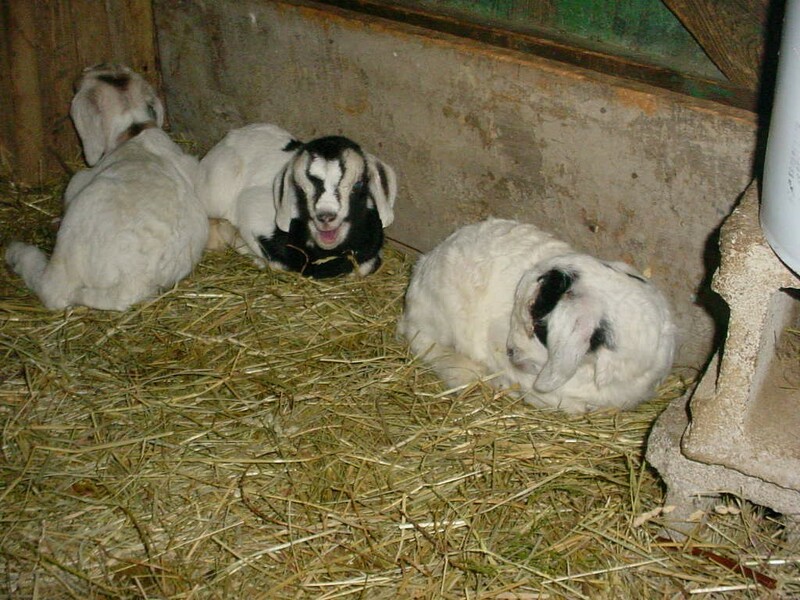 The major problem was getting Jonquil into the birthing stall. I tried grain and cookies, but the other does got in the way, wanting their share. When I picked up all 3 cold, wet, squirming kids to carry them in, she didn’t follow, causing me concern that she might reject all 3. I wound up dragging her in by the horns. She weighs more than I do, and has 4 hooves she can plant. But once in the back stall, and feeling protected, she let me help dry them. She delivered and ate her placenta, which also calmed her. All three are now warm, dry, fed & bonded! After a quick sandwich and e-mail to family, stayed in the stall until Jess arrived and came straight to the barn, with more dry towels. We spread blankets around and she held Jonquil till I was sure all 3 kids had nursed just a little. Finally at 10, having done about what we could do, we collapsed in our own beds. Fell asleep in barn clothes that smelled of birth fluids: clean, metallic, alive and comforting. Had already seen pics but liked ‘re-hearing’ the details ! We reminisce about the time when we were contemplating raising alpacas..God in his wisdom sees to it that those who can.. do.. and those who.. can’t.. choose not to!! Thanks for having this available to read!